Dylan and John were invited to Denver Comic Con as media for the 4th year in a row. We got 9 interviews with comics creators that we will share with you as well as recap the other things we did at the show. Our next podcast will be our review of the Valerian and the City of a Thousand Planets film on July 23rd. In this episode: We kick back with The Unstoppable Wasp writer Jeremy Whitley, then we present the Making Action (Labs) Comics! panel from Captain’s Comics Expo with Alex and Jeremy! Comic News Insider: Episode 543 is now available for free download! Click on the link or get it through iTunes! Sponsored by Dynamic Forces. The podcast wife Erica Schultz (M3) returns! She and Jimmy chat about the upcoming Special Edition convention here in NYC and the multitude of great guests attending. They also have a mini-argument about live tweeting TV shows (she does, he doesn’t) but their friendship endures! News includes: Bill Watterson returns to comics, first all female creative team takes on the Fantastic Four comic, DC finally going to credit Bill Finger, Peyton Reed takes over directing duties on Marvel’s Ant-Man film, and Jeffrey Brown returns to Star Wars. Leave your iTunes comments! 5 stars and nothing but love! 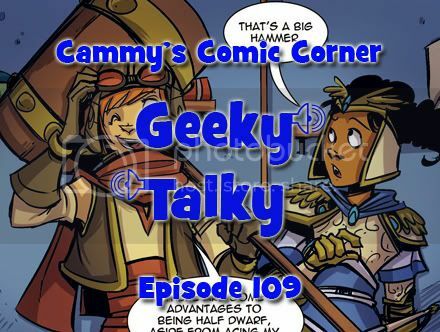 On this Comics Alternative interview show, Gene and Derek talk with Jeremy Whitley, the writer of the Eisner Award-nominated Princeless series and the outgoing Director of Marketing at Action Lab Comics. Jeremy talks with the Two Guys about the genesis of Princeless, his upcoming work on My Little Pony for IDW, the place of all-age comics, and the representation of women — especially in its impact on girls and younger women — in comics today. He also shares his experiences in marketing for Action Lab over the years, as well as his hopes for his new role as the publisher’s Education Outreach Director. All in all, Gene and Derek have a great time talking with Jeremy about his work as a creator and his efforts behind the scenes at Action Lab.